Are you friends with the perfect guy or girl who is intelligent, good looking, fun to hang out with, but just not your type (are you crazy)? Do you love meeting lots of new people? Are you still looking for that special someone? Is your calendar bare on February 14th? If you answered "Yes" to one or more of these questions, you need to get all of your friends (and all of their friends) together for a super Valentine’s Day Matchmaker Party. Invite each of your single friends to each invite a single friend of theirs. This way everyone has a chance to meet a great person. Your "perfect match" may be closer than you think! This is a casual and fun party that can take place just about anywhere. Aside from someone’s house or a party room, some fun locations for this bash are a roller rink, bowling alley, restaurant/bar, or even at a park if the weather will cooperate. 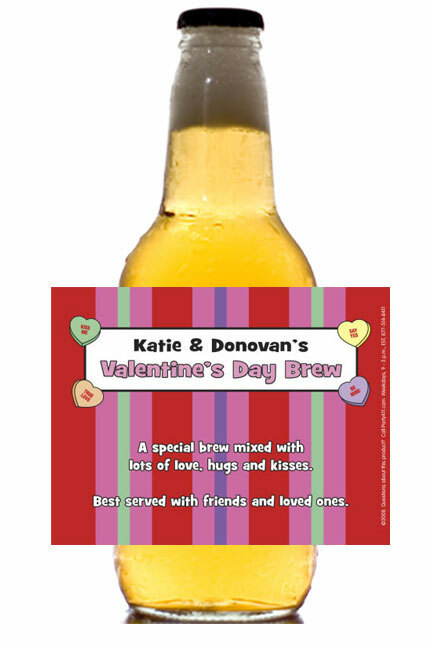 Send a homemade valentine to each of your friends inviting them to your Matchmaker Party. Or for a "sweet" invitation, hand deliver a box of Conversation Hearts to each guest with a matching personalized Valentine's Day invitation glued on to the back of the box. You can even give each guest an extra box of candy to give to his or her platonic "date." A red or pink ticket invitation works perfectly for this party. It will make your guests think this is a party not to be missed - and it won't be! Pop some party beads into each envelope. Guests love wearables! Don't forget a handful of paper confetti for a surprise. If you are looking for a silly way to invite your guests, buy plain white cards and design your own invitations with stickers, confetti (inside), and a lipstick adorned mouth imprint on the front of the invitation. Go all out with a custom caricature invitation - your wish is our command! Make sure to include all of the pertinent details such as the date, time, dress, location, impending activities, and don’t forget to tell them to bring a friend. Decorations for this party are really inexpensive and easy. If you are having the party in your home you will want to provide your guests with a fun and romantic atmosphere (it is Valentine’s Day after all). 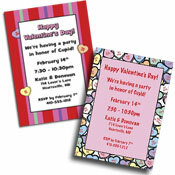 Cover your tables with confetti, and use Valentine's Day paper goods for your finger foods. For a warm touch add a few scented candles to the room as well as some construction heart cutouts either on the walls or hanging from the ceiling. Music is a must at this type of party. Whether you choose to play classical music, love songs, anti-love songs, swing music, pop tunes, or country jams is completely up to you. However you decide to decorate, keep your decorations fun! Make your venue a comfortable place where guests can mingle (and flirt)! Grab a Man- This is a quick game to pair up couples (if they are not already paired). Blindfold all of the women and have all of the men walk around them in a circle. When the host/hostess says, "Go", have the women each grab a man. When all of the men have been caught, have them remove the blindfolds. Then, have the couples share a dance and repeat! Proverb Partners - Before your guests arrive, write proverbs in two different pieces on index cards. For example, write "Honesty" on one card, and its match, "is the best policy" on another card. Tape a card to the front of each person who arrives at the party. Once everyone is there and has a tag, tell people to mingle until they find the person who completes their sentence! The last couple to find each other gets a "booby prize". Pass the ‘Pick - Separate your groups into teams that are lined up man-woman-man- woman and so on (with at least 6 people per row, and as many rows as you would like). Put a toothpick in the mouth of the first person in each line, and the line to pass it the quickest from person to person wins a prize. This can also be done passing an orange under the chin, or a dollar between the knees. Matchmaker, Matchmaker - For a fun way to find your perfect match at your huge singles party, have everyone write down five things that are true about them, and five things that are important to them in a mate. Everyone has to walk around the party and find a person who fits at least three of the criteria on their list, or whose criteria they fit. It should be fun to see how long the game lasts before people start talking and forget about finding their "perfect match." This game is just a great way of breaking the ice and meeting new people. Can't Get Enough - Have each person at the party write down five things that they can't get enough of (or a list of favorite things), and make sure that they don't put their names on the lists. Gather the lists and read them to the group one by one. Everyone has to try and guess which list belongs to which person. For more games and activities, see our Games for Couples. Valentine's Day feather boas are perfect for your female guests. Valentine's Day toys like wooden roses, heart pluses, and stickers are easy favors that friends can grab as they head out the door. Some other fun ideas are chocolate body paint, champagne, or gift certificates to a multitude of romantic stores and restaurants. 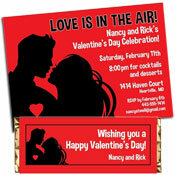 You can never go wrong with personalized Valentine's Day candy bar wrapper from your friends at Party411.com. Don't forget personalized Valentine's Day favor bags so your friends have something with which to carry home their goodies. 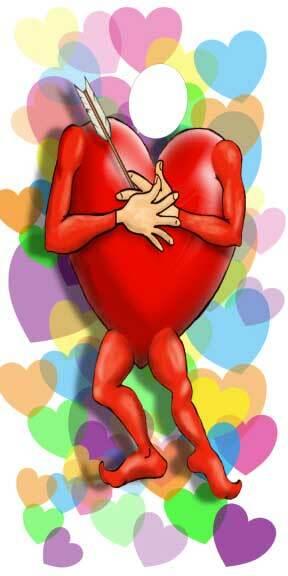 Have a wonderful Valentine's Day from your friends and Party411.com!